How did Edmonton come to be known as a prairie city? Edmonton is located within the Aspen parkland biome, the “very large area of transitional biome between prairie and boreal forest.” So how did Edmonton come to be known as a prairie city? That's the question that Chris Chang-Yen Phillips and Dustin Bajer explored for Episode 25 of Let’s Find Out, a monthly podcast about Edmonton, Alberta – aka Amiskwaciwâskahikan – on Treaty Six territory. Each episode, host Chris Chang-Yen Phillips takes questions from curious Edmontonians about local history and works with them to find out the answers. 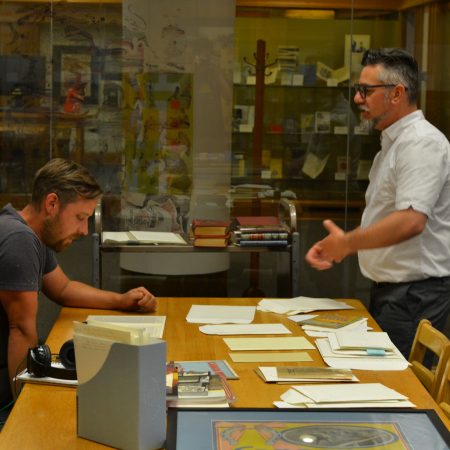 Their investigation took them to the Bruce Peel Special Collections at the University of Alberta, to the Coates Conservation Area, and to the office of the Confederacy of Treaty Six First Nations. Finding out the answer — and figuring out whether this area is aspen parkland, or prairie, or forest — challenged ideas about the land we live on. Taproot Edmonton is proud to commission this episode, the first of a series of collaborations with Let's Find Out. This story started as a question that Taproot member Dustin Bajer seeded in our Story Garden. If you have a question about how or why something happens in Edmonton, or you would like to see what others are curious about, join Taproot. You’ll help us put another story like this into the world. Photos by Mack Male & Chris Chang-Yen Phillips.